Corn Starch Cake. Mrs. Morris. No 3. 1 cup butter 2 cups sugar 1 cup sweet milk 2 cups flour 1 cup cornstarch the whites of 7 eggs 1 tea spoon cream tartar 1/2 teaspoon soda Rub butter & sugar to a cream - mix flour, starch & cream tartar together. Jelly Cake Mrs. Matson No 1. 1 cup butter 3 cups sugar 3 & 1/2 cups flour 1 cup sweet milk 5 eggs, 2 teaspoon cream tartar 1 tea spoon soda. Bake on thin sheets - jelly between. Jelly Cake. Mrs. Dean. No 2. 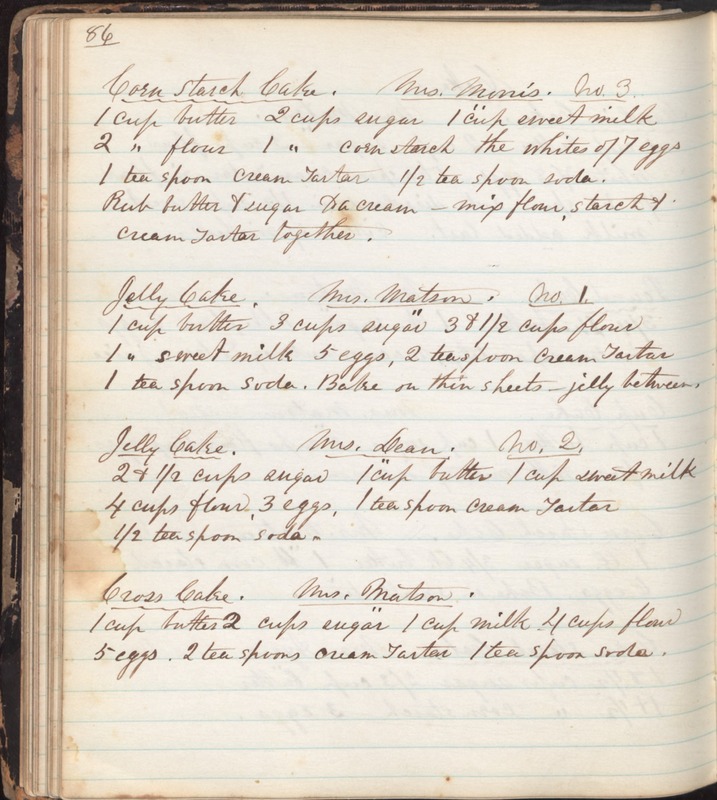 2 & 1/2 cups sugar 1 cup butter 1 cup sweet milk 4 cups flour, 3 eggs, 1 teaspoon cream tartar 1/2 teaspoon soda. Cross Cake. Mrs. Matson. 1 cup butter 2 cups sugar 1 cup milk 4 cups flour 5 eggs 2 tea spoons cream tartar 1 tea spoon soda.